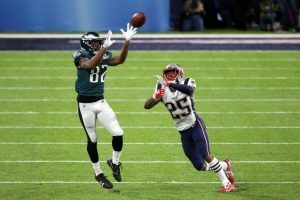 Philadelphia Eagles reached an agreement with the Carolina Panthers to trade Torrey Smith, their veteran wide out to the Panthers for Daryl Worley, a cornerback, said sources close to the deal. Smith, who is 29, last season had 36 receptions for 431 yards and a pair of touchdown for the Eagles. During the postseason, Smith caught 13 passes for 158 yards with one touchdown. Philadelphia is going to exceed the salary cap by approximately $14 million and must shed salary before March 14 when the new league year begins. Smith will earn a salary for 2018 of $5 million, while Worley will earn $650,000. Through a post on Instagram, Smith thanked everyone with the Eagles as well as the fans. He also thanked all his teammates, who he said he would miss them the most. He added that he had never experienced so much fun playing fun as he did with the Eagles. Worley both a starter and substitute during the second half of last season with the Panthers did not play as well as James Bradberry, who started at the other cornerback position opposite him. Worley, who is just 23, started 14 out of 15 games if healthy. During Week 6, he was pulled following just the second series in a game against Philadelphia sat for most of the remainder of the game. He started most of the remaining 11 weeks but he was subbed out quite often. He ended the season with a pair of interceptions, one sack and 10 passes defended. Worley joins a young corps of cornerbacks with the Eagles that includes at this time Ronald Darby, Jalen Mills, Rasul Douglas and Sidney Jones. Carolina will get in Smith a veteran receiver the team’s head coach Ron Rivera indicated he was looking if he signed a free agent. Kelvin Benjamin was traded by Carolina during the season to Buffalo for two draft picks in November and the Panthers hope to add to their corps of receivers Devin Funchess, Curtis Samuel, Russell Shepard and Damiere Byrd. Smith is a speedy receiver that has big play ability. He played inconsistent last season with the Eagles. He has won two Super Bowls and caught a 41-yard reception for a touchdown against Minnesota in the NFC Championship Game and five passes for 49 years against the Patriots in Super Bowl LII.